A good turn out yesterday with Bill Dobson, Ian Pearson, Nigel Hall, Peter Ellis and Ian Pearson, and after a cup of tea work started, although Nigel had been working since 7am varnishing the rear end of the tender. Having got it finished, he was then told the MPD were going to take out the brick arch from No 29 which would have created a considerable amount of dust. Having expressed his irritation and covered the rear of the tender with a large dust sheet to minimise any contamination, it was then decided by the MPD to postpone their work to Friday as they could not find anyone able to get in No 29's firebox! Elsewhere, I set about stripping the cover off the steam brake cylinder so as to examine the piston. The nuts were removed without the need for heating them up, much to Peter's disappointment, but, in spite of my efforts and those of Bill with the hammer and pinch bars, we were unable to extract it . Something for the Saturday team to have a go at! Peter and Ian started to set up the splitting gear to release the piston rod from the crosshead and also to remove the gland packings. 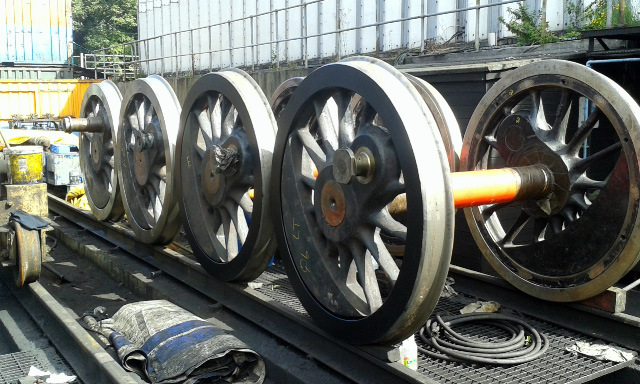 Unfortunately most of the splitting gear brought from Carnforth yesterday didn't fit the Q6. Fortunately, Andy Lowes had given Peter the J27 gudgeon pin equivalent from Hopetown with which, using the NYMR splitting gear, they managed to split the L/H crosshead. Bill and Barney from the MPD also gave us some assistance in getting the job set up. 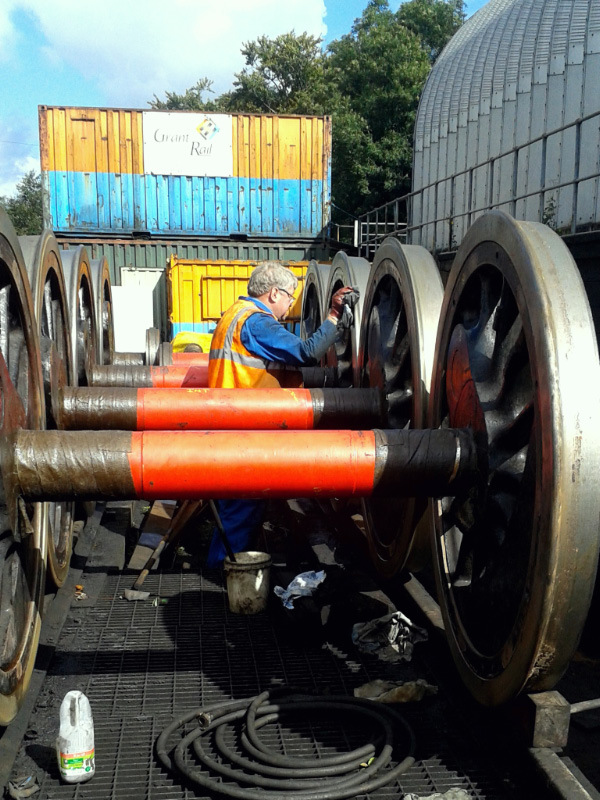 The gear was then taken round to set up for the R/H crosshead to be split on Saturday. Bill has tapped the 6 header plug holes 1 1/4"BSP and he is sending Andy the dimensions of the plugs required by Email. Also Peter has one of the old plugs to give to Andy. Nigel completed cleaning and painting the new tyre outside and inside rings. Bill has put a new work schedule up in the workshop with all jobs itemised showing which work NELPG will be doing and the work allotted to NYMR. Work still continues tapping the flues. Three are left to do and Mark O'Brien expects them to be completed next week. The boiler inspector is due to visit on Friday to meet Bill with a view to providing a report on the boiler so his recommendations are on the formal record. The regular Saturday/Wednesday working party routine has now been re-established, so there will be another working party on Saturday, so, if anybody would like to come to Grosmont there continues to be plenty to do! The Great Marquess left Grosmont for Scotland and its new home with John Cameron yesterday morning, and that 45212 arrived to augment the operating fleet while Repton is away. 45212 is staying until at least the Autumn Steam gala at the end of September.